Slow Down” is the first in a series of events curated for our bodies and our minds to understand different aspects of the Slow movement. In the course of the series we shall engage with texts, music, movie clips while also taking the journey with our bodies to experience the touch of the soil and the taste of slow cooked food. The series aims to create and cultivate a community which is committed to making conscious choices in terms of what we eat, what we make and what we buy. In this event we shall read, discuss and participate with texts like Carlo Petrini’s book “slow food: the case for taste”, Vandana Shiva’s piece on “Monoculture of the Mind”, Charles Eisenstein on the paradigm of “keeping time” along with clips from Andy Warhol’s “Empire” and Norway’s “Slow TV”. 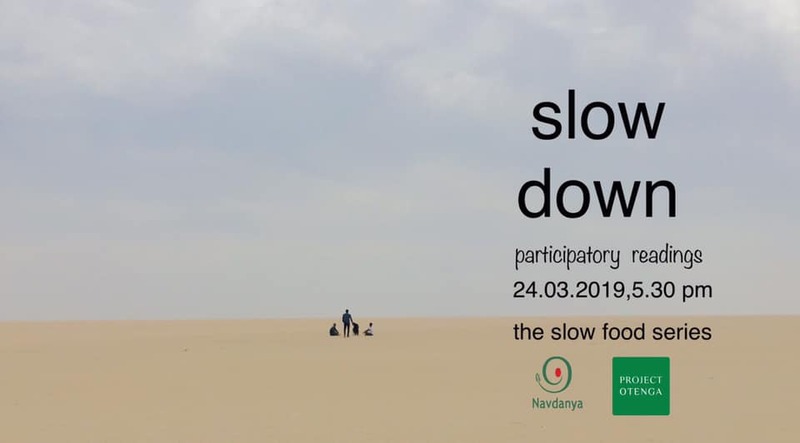 This series is a collaboration between Navdanya and Project Otenga to encourage the art of slow food and building a conscious community towards a sustainable food future. Navdanya is a movement for Earth Democracy which is actively involved in the rejuvenation of indigenous knowledge and culture. It is a women centred movement for the protection of biological and cultural diversity. It actively engages in slow food and sustainable food producing practices at the level of small farmers and artisan food communities.